As I have a number of stories in various stages of development and/or writing, I also have a lot of images in folders, and my mind. A couple of days ago I got really fed up of having no room for the images for my Mary Street competition entry; at the end of every writing session they had to go back in the folder, and that cut the connection with the story and the characters. Plus there were numerous bits of paper slipping off my desk! It's never been a problem with my historical based stories as I know the plots and the important images are set in my mind. But this competition entry is being created as I write, so I need the constant contact with the people I've imagined and the plot ideas in this story. So yesterday I bought a large cork board-self-healing- and it has a surround with corner fittings so you can screw it into the wall (not that I'll be doing that with it). I was quite surprised how quickly I responded to having the images in one place, as every time I see the board my sub-conscious gets a jolt. It also acts as a reminder I should be writing rather than chatting on Facebook! Perhaps it will also help me sort out a suitable title. 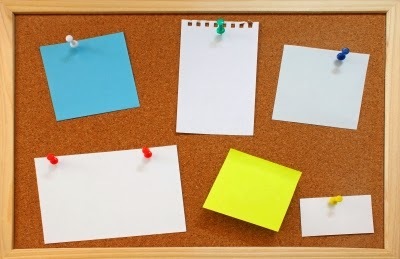 Do you use an image board, or do you just blu tack your pictures on the wall? I don't use one yet, Carol, but I do love Pinterest for making mood boards and gathering visual ideas. I've never used images to help me write (except when it's a competition requiring that to be done). I still manage to have lots of bits of paper slithering off my desk though. The plaster on our walls is so soft that I can stick a drawing pin straight in, so I have stuff all over the place! Nots, calendar, photos and yes, pictures to inspire me. That sounds like a great idea, Carol - kind of like a designer's mood board - keeping all your ideas and notes in one place and providing inspiration whenever you look at it. Good luck with the story! Thanks. I've always found visuals get my brain working, Maxi. There's now additional sticky notes pinned to the board too.